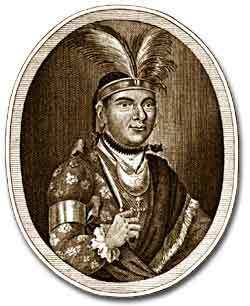 Mohawk Indian Thayendanega, also known as Joseph Brant, served in the British army as an interpreter of native languages during the Revolutionary War. While the previous explorations of African American and white female experience suggest both the gains and limitations produced in the Revolutionary Era, from the perspective of almost all Native Americans the American Revolution was an unmitigated disaster. At the start of the war Patriots worked hard to try and ensure Indian neutrality, for Indians could provide strategic military assistance that might decide the struggle. Gradually, however, it became clear to most native groups, that an independent America posed a far greater threat to their interests and way of life than a continued British presence that restrained American westward expansion. Cherokees and Creeks (among others tribes) in the southern interior and most Iroquois nations in the northern interior provided crucial support to the British war effort. With remarkably few exceptions, Native American support for the British was close to universal. 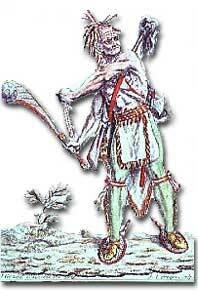 This drawing shows an Iroquois warrior dressed for battle. The experience of the Iroquois Confederacy in current-day northern New York provides a clear example of the consequences of the Revolution for American Indians. The Iroquois represented an alliance of six different native groups who had responded to the dramatic changes of the colonial era more successfully than most other Indians in the eastern third of North America. Their political alliance, which had begun to take shape in the 15th- century, even before the arrival of European colonists, was the most durable factor in their persistence in spite of the disastrous changes brought on by European contact. During the American Revolution, the Confederacy fell apart for the first time since its creation as different Iroquois groups fought against one another. The Mohawk chief Thayendanegea (known to Anglo-Americans as Joseph Brant) was the most important Iroquois leader in the Revolutionary Era. He convinced four of the six Iroquois nations to join him in an alliance with the British and was instrumental in leading combined Indian, British, and Loyalist forces on punishing raids in western New York and Pennsylvania in 1778 and 1779. These were countered by a devastating Patriot campaign into Iroquois country that was explicitly directed by General Washington to both engage warriors in battle and to destroy all Indian towns and crops so as to limit the military threat posed by the Indian-British alliance. In spite of significant Native American aid to the British, the European treaty negotiations that concluded the war in 1783 had no native representatives. Although Ohio and Iroquois Indians had not surrendered nor suffered a final military defeat, the United States claimed that its victory over the British meant a victory over Indians as well. Not surprisingly, due to their lack of representation during treaty negotiations, Native Americans received very poor treatment in the diplomatic arrangements. The British retained their North American holdings north and west of the Great Lakes, but granted the new American republic all land between the Appalachian Mountains and the Mississippi River. In fact, this region was largely unsettled by whites and mostly inhabited by Native Americans. As a Wea Indian complained about the failed military alliance with the British, "In endeavoring to assist you it seems we have wrought our own ruin." Even groups like the Oneida, one of the Iroquois nations that allied with the Americans, were forced to give up traditional lands with other native groups. When British General John Burgoyne marched from Canada to Albany, some of the Native American warriors he enlisted began killing settlers. When the news of Jane McCrea's murder reached major cities, many young Americans enlisted to fight. Despite the sweeping setback to Native Americans represented by the American Revolution, native groups in the trans-Appalachian west would remain a vital force and a significant military threat to the new United States. Relying on support from Spanish colonists in New Orleans as well as assistance from the British at Fort Detroit, varied native groups continued to resist Anglo-American incursions late into the 19th century. This ongoing resistance resulted in treaties with the United States that would much later be the basis for redressing some illegal losses of Indian lands. Although the meaning of the Revolution for most Native American groups was disastrous, their continued struggle for autonomy, independence, and full legal treatment resulted in partial victories at a much later date. In some ways, this native struggle showed a more thorough commitment to certain revolutionary principles than that demonstrated by the Patriots themselves. Artists who traveled North America after the Revolution managed to capture the ways of a fading civilization. The sketches and paintings at this Yale Library site show Native Americans homes, rituals, and more. Each image is accompanied with info about the artist and the art itself. Enjoy this feast for the eyes as you learn more about post-War Native American life. 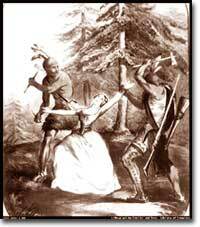 The Oneida took a bold step when they broke from the Iroquois Confederacy to support the patriot cause. Their decision cost them property, respect from other tribes, and the lives of nearly a third of their people. But their contributions were vital to the patriot cause. "Forgotten Allies" is an online book, also available in printed form. The history of Native Americans in West Virginia takes on many of the same characteristics as a roller coaster ride — 1773 saw fighting, 1775 brought a peaceful agreement, 1776 brought more conflict; the ups and downs were fast and many. 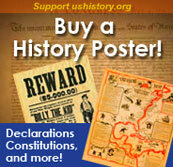 The end didn't come until 1794, when another treaty ended all Indian land claims in the region. Produced by the West Virginia state archives, this text essay sorts through the jumble and gives you a clear look at the demise of tribal life in the area then known as "western Virginia." The Indians of the Great Lakes area are the focus of this history page. The triumphs and tribulations of tribes such as the Miamis and Delawares are discussed in detail. Scroll down for a look at the chapter on "Indian Treaties and Removal — 1780-1840" for more on the post-Revolution experience of the Native Americans of the region. With the signing of the Treaty of Greenville, America took its first step towards defining the western boundaries of the new country. The treaty brought much desired peace to Ohio by promising the Native Americans land and goods. Read the treaty here to learn the location of the borders and just what the natives received from the new government.